Decoder is a server-based application designed to perform conversion of Russian characters between different encodings. Decoder identifies the encoding of Russian text, and converts it into a proper or chosen encoding using sophisticated parsing algorithms. This tool solves problems related to an incorrect display of Russian characters in emails, web applications, etc. It detects the following encodings: KOI-8, DOS, Mac, ISO, UTF-8, and converts the text into the Windows Standard encoding. Decoder also performs a user-defined conversion of Russian text between various platforms (Windows and Mac). Decoder includes a transliteration module, which can represent Russian text with Latin characters (transliterate) in order to facilitate the transmission of Russian messages via the Internet. The transliteration module uses a conversion algorithm adapted as close as possible to the common transliteration rules. 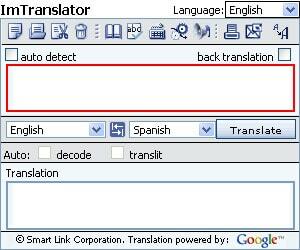 Decoder can perform an opposite conversion from Russian transliterated text to Russian Cyrillic.